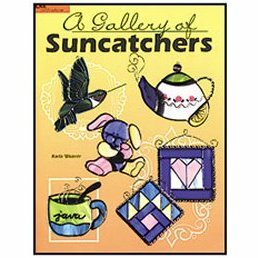 A collection of forty bright and colorful suncatchers in a variety of themes. Lead wrapped glass for easy assembly with a professional look. Patterns include a teapot, hummingbird, birdhouses, coffee cup, quilt squares, sports themes, Christmas designs, pets and animals, and an apple for the teacher!